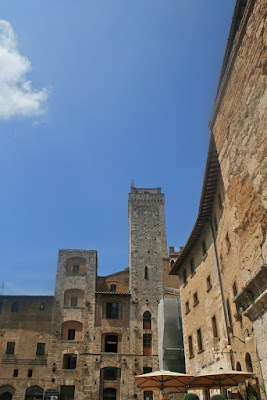 I have to say that my best impression of San Gimignano is from far away. It sits on a hill in the picturesque Tuscan countryside, and as you approach you can see the walls and towers. Once inside the walls you can appreciate why this town has been declared by UNESCO to be a World's Architectural Heritage site, but only if you look up. 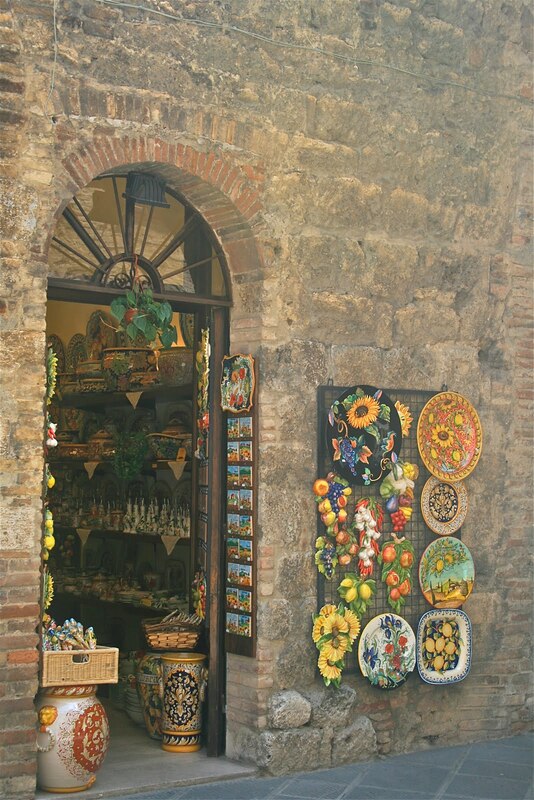 The small streets are completely invaded by tourists, and every single door or opening in the Medieval walls seem to be have been turned into shops selling souvenirs. So most of my photos were taken with the nose up in the air! 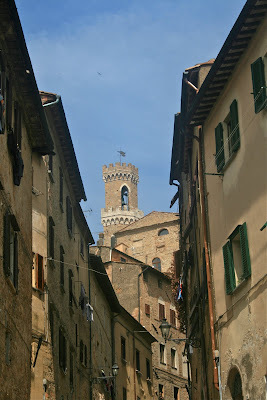 The drive from San Gimignano to Volterra is one of the best drives I had in Tuscany. The scenery is just spectacular, pity that all the photos were taken from my passenger seat (yes, sorry about the bad quality) as, unlike New Zealand, here there aren't designed 'look out points' where you can just stop the car and get out to take a picture. 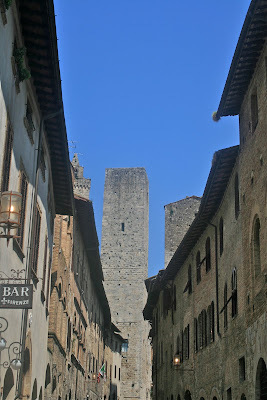 Here too there are tourists but, as the city is bigger that San Gimignano, you can still find quiet streets to explore. 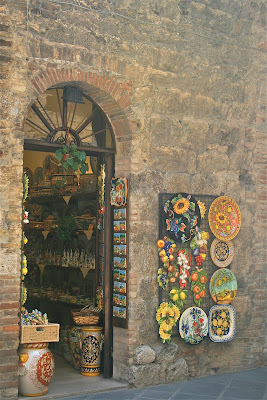 Many of the souvenirs shops sell alabaster goods, since Volterra is renowned for this material. 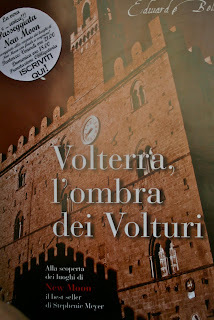 Volterra has registered a considerable increase in tourism thanks to Stephenie Meyer's Twilight Series. and told us to come back in the evening for a special Volturi City tour with surprise ending. We couldn't stay for the evening tour, so we had to do with the special New Moon map of Volterra (available in English from the Tourist Office) which followed the yellow Porsche drove by Alice through the city's door, and then Bella's run to save Edward. I have never seen my daughter look at a map so closely! (beautiful Roman Theatre and Ruins), and its Medieval look. I did :-)! I am enchanted with your photos, Alessandra. What a beautiful area! Nigel, let me know, I may be still here. 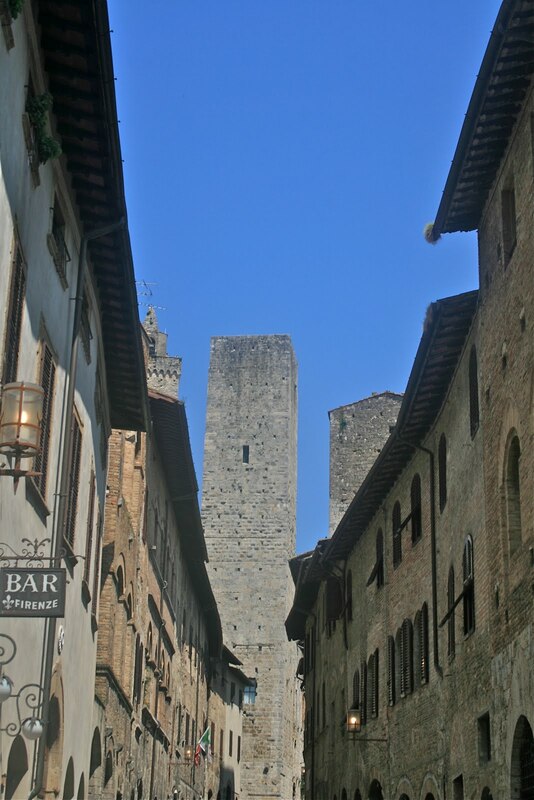 Bellissima San Gimignano, hai mangiato il gelato fra le mura della cittadina..troppo buono! oh, i don't know when i could visit Italy. i dream to go there so often. have a good trip, Alessandra! A wonderful adventure. I'd love to drive through countryside Italy.